"Mr. Daley, foreman, and three of his workers, stand amid the 12-foot high cornstalks in the Beebe cornfield. 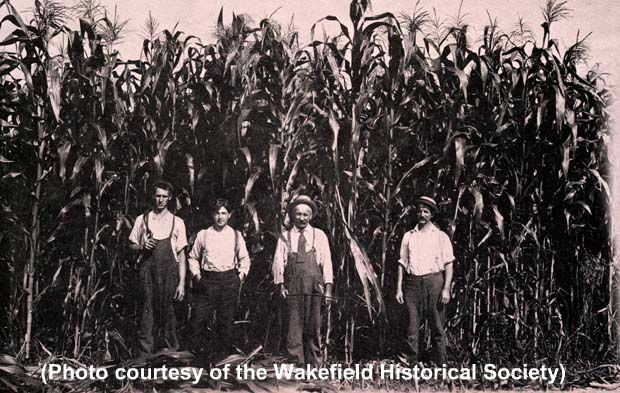 It was reported that the corn grown on the farm was a perennial prize winner at the annual Reading-Wakefield Fair. Built in 1810, the Beebe farmhouse was designed as a 'gentleman's estate' for a member of the Forrester family of Salem. The house was purchased by Lucius Beebe in 1852. The farm, with its vegetable and flower gardens, milking cows and horses, flourished in the late 1800's and early 1900's under Junius Beebe's supervision. The eighth son of Lucius and Sylenda (Morris) Beebe, he was the first of their children to 'come into the world beneath the roof of the new homestead.' It was Junius who added considerably to the estate's acreage and increased its productivity." -- Text from calendar by Jayne M. D'Onofrio. “Junius Beebe's farm, 1908,” NOBLE Digital Heritage, accessed April 20, 2019, https://digitalheritage.noblenet.org/noble/items/show/6996.